Women have had a historical role in the support and survival of acequias for generations, including their role as farmers and irrigators, serving as elected officials in some cases, providing labor and meals for other laborers, and teaching children the values of land-based culture and way of life. Las Comadres Caucus is a group of women in acequia leadership that hope to nurture, empower and bring other women in leadership together. The New Mexico Acequia Association is opening a space for women in the Noticias de las Acequias to reflect on seasonal land based traditions, organizing, and other personal endeavors or struggles they are a part of in order to develop and strengthen support systems for women leaders, particularly in acequia communities. Acequieras unidas defenden agua, tierra, y familia! It was nineteen eighty something and we were on the move, yet again. As we crossed the border from one county to another, in the rain and in between the thunder and lightning, I swore that I would hold my breath until the day I could return home. Home. San Miguel County. The place of my birth where I could breathe, think and be free to be the Mestiza, Chicana radical thinker/dreamer that I was born to be. San Miguel County, the place where I learned about poetry, arte, music, literature, theatre, history and me. San Miguel County, where I saw my first live play at Ilfield Auditorium; where I saw Don Quixote: Man of La Mancha at the Kiva; San Miguel County where the Red Clay of Mother Earth holds my roots- where the veins of precious water and la tierra have always been and will always need to be protected. Moving from San Miguel County to a place that was as unfamiliar to me as I was to it, at a time when I was (or so I thought) just beginning to figure out my place in this Journey, met me with openness and nurturing welcome. By way of Santa Rosa, we landed in Puerto de Luna on farmland. We had lived on farmland before, where we grew calabasas, maiz, pepinos, peas, chile y mas. One place we had access to irrigation by the acequia; the other we watered with well water. In Puerto de Luna, we grew maiz, chile, ajo, sandia, melon, pepinos, radishes, peas, beets, quelites… off the acequia which get its water from the Rio Pecos. We had our own animals and therefore our own source of meat. Sure we were 11 crowded in a four room house, sometimes without water, sometimes without heat but we had good food to eat… and books, lots of books to read. We dried, froze and canned food for the winter months…carne seca was and still is my favorite (though, I can be persuaded with cabrito cooked in a pit, or capulin jelly.) Puerto de Luna accepted my curiosity and showed me Her gifts. I spent many hours atop La Mesa Encantada day dreaming and declaring to the hawk circling above, "I will never leave this land- I shall be a farmer!" It is now nearly the year 2016 and I am still holding my breath hoping to return home. Though I have lived in Albuquerque for twenty years I have never accepted it to be my home. A few years ago I was invited to a local poetry event in 'Burque and for the first time I felt like I fit in. It did not take me a long time to figure out why… this particular monthly poetry community gathering brought in folks from El Norte…folks like me who shared words about farming and traditional life- something I felt at home with- like smelling piñon and orange peels on top of la estufa. 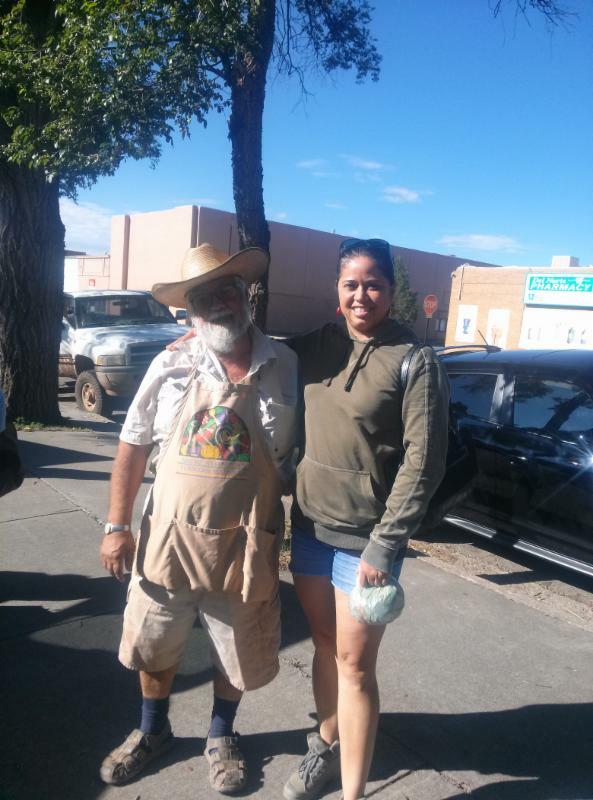 I met women who are leaders within the New Mexico Acequia Association and started to connect. Feeling like I could share my story and dreams with these beautiful, intelligent, and dedicated women reminded me that I can return to farm and learn from my Dad- what he tried to gift to me but I resisted, so many years ago. If not for the breath in between the lines of poetry I write, I might have forgotten that I am a farmer. Seems like poetry held my breath for me so I could breathe and live until I get home.